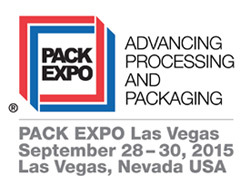 BELLEVILLE, NJ USA (August 4, 2015) – VAC-U-MAX announces exhibition at Pack Expo 2015, September 28-30, Las Vegas Convention Center, Las Vegas, Nevada, Booth S-7422, exhibiting ready-to-operate processing and packaging solutions for powder and bulk ingredient transfer in the food, pharmaceutical, and chemical industries. Specializing in the design, manufacture, engineering, and automation of processes, VAC-U-MAX combines state-of-the art electronic technology, with innovative mechanical and pneumatic systems, designing ready-to-operate systems for conveying, weighing and batching of dry bulk materials in packaging processes. Equipment on display includes a continuous bulk material transfer system for packaging applications, incorporating sanitary receivers designed to convey powders, milk powder, flakes, tablets, and any other granular bulk materials. For pharmaceutical applications, VAC-U-MAX offers complete and ready-to-operate tablet press loading systems. Additional processing and packaging automation equipment and systems include flexible screw conveying systems designed to handle bulk materials without separation of product, bulk bag loading and unloading systems, and batch weighing systems for the movement of multiple ingredients to a processing or packaging line. For more information visit www.vac-u-max.com/PackExpo. VAC-U-MAX offers a full range of bulk material handling equipment and systems incorporating pneumatic, mechanical, and flexible screw conveying technologies. VAC-U-MAX systems are designed to deliver flexibility, integration, and efficiency, combining modern computerized technology with innovative bulk material transfer technology, for automated dust-free ingredient handling with little or no human interface. A UL listed designer and fabricator of control panels for general purpose and hazardous locations, VAC-U-MAX control systems can be configured to control a wide range of batch-weighing systems. Smart control stations can be located in remote areas of the plant away from production machinery, and are designed to communicate with plant DCS systems. Engineered to transport powders and granular bulk materials without separation of product, the AERO-FLEX system utilizes a stainless steel or carbon steel one-piece helix, enclosed within stationary plastic tubing, transferring bulk material from feed hopper to discharge point, quickly and efficiently. Typical applications include transferring most types of bulk materials including, food ingredients and pharmaceuticals from bulk bag unloaders, bag dump stations, and feed hoppers, filling machines, blenders/mixers, surge hoppers, bulk bag loaders, grinders, pulverizers, air classifiers and to load and unload sifters. Designed to convey powders, milk powder, pellets, flakes, granular materials, or any difficult conveying powders, VAC-U-MAX systems offer continuous conveying for many applications including hopper loading, loss-in-weight feeder refill, blender loading, batch weighing, tablet press loading, or any application that requires a high level sanitary design, frequent cleaning, or material-from-air separation. All VAC-U-MAX components function as a single system for continuous operation, with increased throughput creating cost savings and plant operation efficiency over time. VAC-U-MAX application experience includes batch weighing systems and multi-ingredient handling systems where bulk ingredients are weighed at pick-up-point for loss-in-weight transfer or at the end of the system for gain-in-weight transfer. VAC-U-MAX sanitary receivers offer the most versatile solution for the handling of free and non-free flowing powders and other bulk materials. Many configurations are available, dependent on conveying applications, including batch weighing, loading tablet press machines, mix tanks, blender loading, hopper loading, and loss-in-weight feeder refill. All food and pharmaceutical equipment is constructed from 316L Stainless Steel and USDA accepted, with convey rates ranging from 500 pounds (227 kg) per hour to 5,000 pounds (2,268 kg) per hour and beyond. A variety of discharge valves types and finishes are available. VAC-U-MAX designs and manufactures pneumatic conveying components and systems for vacuum conveying, batching, and weighing of powders and bulk materials in the food, pharmaceutical and chemical industries. The primary technology for conveying is vacuum, however VAC-U-MAX also specializes in positive pressure systems and mechanical conveying. Since 1954, VAC-U-MAX offers solid application and process automation expertise for bulk materials handling, including the design and manufacturing of a full range of industrial vacuum cleaning units and fully-integrated systems for high volume dust, combustible dust, fine powder, bulk material, or liquid recovery. Product line also includes mechanical / flexible screw conveying systems, bulk bag loading / unloading systems, bag dump stations, and UL-listed control panels. For more information visit www.vac-u-max.com or email info@vac-u-max.com for more information.